Benefiting from a mild climate and with an abundance of palm trees and other sub tropical vegetation, it is not hard to see why Torbay is known as The English Riviera. 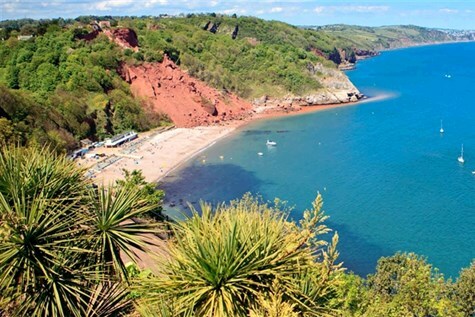 Our base, Babbacombe, enjoys a level location, perched high on the cliffs above Babbacombe and Oddicombe beaches, with beautiful well-kept gardens and bustling town centre. LIVING COASTS, TORQUAY: Torquay is a stylish seaside resort with palm lined promenade, pier, marina and gardens. We include admission to Living coasts, the coastal zoo and aquarium on the seafront, with penguins, seals, puffins, otters, octopus, sea horses and much more. TOPSHAM AND RIVER EXE CRUISE: Once a thriving port, Topsham is now a pretty maritime town with a mix of fascinating architecture, antique shops and pubs. We also include a delightful cruise on the River Exe. This recently refurbished hotel commands a superb sea front location, with stunning views across the Babbacombe Downs and Lyme Bay. All rooms include hairdryer, TV and hospitality tray. The hotel has a lift, sea-view restaurant, bar and regular entertainment.